Child Sponsorship has been a successful catalyst for community transformation for over 80 years. It has a unique way of bonding sponsor and child that nurtures loyalty in the supporter to stick with the family through thick and thin. Food for the Hungry (FH) Canada, specifically, has had the joy of facilitating these special relationships since 1989. Through monthly donations, selfless Canadians have spent the past 28 years faithfully rewriting the futures of thousands of children stuck in poverty. With financial support and encouraging letters, sponsors have provided them with practical skills and invaluable hope. And along the way, 76 communities comprised of tens of thousands of families have graduated from poverty into a sustainable future. You see, Child Sponsorship not only gives a child an education, nutrition, and healthcare, it also supports transformative programs in the community, providing parents with income-generating skills, neighbourhoods with water, families with health education, and so much more. At FH Canada, we call this Child Focused Community Transformation. I had the privilege of witnessing firsthand how wide the impact of Child Sponsorship spreads. In July of 2016, I travelled to Cambodia as a new staff member with FH Canada. In October 2017, I led a women’s vision trip back to Cambodia. These visits to Food for the Hungry communities forever changed my perspective on the power of Child Sponsorship. “This is an FH community, isn’t it?” asked Wendy, one of three women I recently brought to Cambodia. “Look at how clean the yards are compared to that other area we went through. And every time I see people here they are doing something purposeful. Look over there. Even the kids are fishing!” Wendy exclaimed. I took in our surroundings with different eyes as we drove on to the home of my team member’s sponsored child, Vimean, and his family. Mr. and Mrs. Nhahn with their three sons (from the left) Visal, Bory, and Vimean, and Carmyn. As we pulled into the long driveway, three boys came running toward the van. We exited and were ushered toward the back of the property. Carmyn, a Canadian Child Sponsor, sat beside Vimean and engaged with him about school. Vimean’s parents stood off to the side beaming. Can a face crack because the smile reaches beyond the muscles’ capacity? Mr. and Mrs. Nhanh’s joy over our visit felt palpable and their gratitude for being able to partner with FH overflowed. In 1993, on his way to fish at a pond on a farm in Tomnup Dach village, Mr. Nhanh stepped on a landmine and lost part of his right leg. He currently has a prosthetic limb and can walk now. But as I would learn, historically, having a disability in Cambodia meant devastating outcomes. “People living with disabilities are most often shunned,” explained a staff member. “Many times they are considered cursed and others avoid them.” I can only imagine the isolation, loneliness, and extreme material poverty Mr. Nhanh had thrust upon him, in addition to his physical pain and loss. But that isn’t true for him today. In July of 2017, FH Cambodia formed a relationship with Tomnop Dach village. Mr. Nhanh’s three boys entered the Sponsorship program and he was selected by his peers to be on the Community Development Committee (CDC). The presence of FH and the Child Sponsorship program is opening doors for this entire family. My mother-heart burst as I listened to these parents describe the opportunities their sons now have. Clearly, it isn’t just the children who are changed by sponsorship. 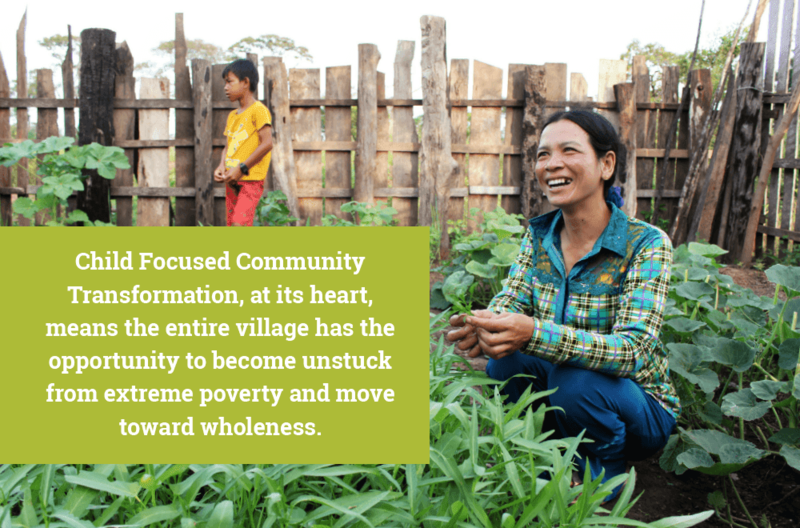 Child Focused Community Transformation, at its heart, means the entire village has the opportunity to become unstuck from extreme poverty and move toward wholeness. I witnessed this firsthand. Mr. Nhanh spoke of the bigger picture. “I am proud of myself…” These words came from the mouth of a man society had cast away for years, simply because of his missing leg. Now he stands tall, knowing he is providing for his family. He beams as he recalls being selected to give leadership to his village. He holds his head up as he tours us around his immaculate property, pointing out trees he’s planted, vegetables he’s growing, chickens he’s raising. He is a changed man. The character of Mr. Nhanh and his opportunity to work and support his family were confirmed by Lorm Sinath, FH Area Team Leader. He described how Mr. Nhanh never misses a meeting where FH and community members gathered to discuss and plan the development of Tomnop Dach. It seems child sponsorship has opened up Mr. Nhanh’s mind to dream again. The hospitality of this little family exuded pride and gratitude as we sat together on their wooden platform sipping fresh juice from coconuts Mrs. Nhanh harvested that day and prepared just for us. Mr. Nhanh’s smile seemed permanent. And this family is just the beginning. The momentum generated because of child sponsorship is steadily spreading throughout Tomnop Dach, causing sustainable changes in livelihoods, education, health, and more. The quality of life improves daily. Mr. Nhanh is not only committed to this process, he’s being transformed by it. I know; I saw it in his smile.